When chewing gum magnate William Wrigley Jr. built the Casino on Catalina Island (circa 1928), he wasn’t thinking about gambling. It was music this visionary had in mind for the elegant circular structure by the sea. Wrigley would no doubt be proud to promote one of the island’s most elegant events, the upcoming JazzTrax Festival, Sept. 30-Oct. 17. With more than 40 artists on three consecutive weekends, the old Art Deco structure is sure to be swaying again. Much like the days when Hollywood’s elite would gather to dance to the era’s Big Bands, the Avalon Ballroom will play host to some of the biggest names in jazz, like saxophonist Phillip “Doc” Martin and guitarist Earl Klugh. I can’t imagine a more romantic place to immerse yourself in soft strings and sultry vocals. And ghosts. The casino and much of the island are haunted, according to The Original Ghost Tours of Catalina, a company that leads after-dark walking tours of Avalon — complete with ghost hunting equipment. There have been reports of a specter in a brown, three-piece suit (perhaps Mr. Wrigley?) and a mysterious interlude on the casino organ. Up the hill, author Zane Grey is said to be walking the halls of the Pueblo Hotel which was once his home. There were, thankfully, no ghosts at the Villa Portofino Hotel, where my son and I stayed on our last island visit. Owners Thomas and Gina Cappannelli wouldn’t hear of it, as their inn is a refuge, reminiscent of a European seaside resort. Pulling our roller bags down the cobblestone sidewalk after arriving by ferry from San Pedro, we were overwhelmed by the number of things to see and do on the island. Vessels bobbed merrily in the harbor as signs advertised everything from fishing expeditions to snorkeling and glass-bottom boat tours. I was relieved to see the Portofino was set back, away from the busy docks and in a quiet spot with its own private sun deck overlooking the beach. If you visit Catalina, be prepared to be charmed. It’s entirely possible you won’t want to leave this Mediterranean-style paradise. 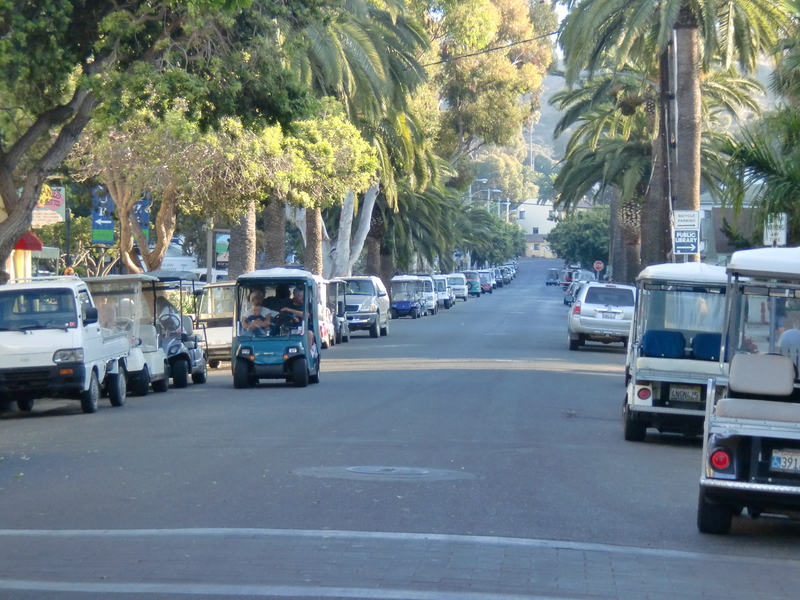 You’ll become one of those people who give up their cars to drive golf carts, because they’re more fun. The air will smell sweeter and the food will taste better and the wine will flow with the abundance of an Italian wedding. And you will dance. Whether you attend next month’s jazz festival or arrive at a future date, you will find yourself dancing on Catalina. It may be as subtle as a spring in your step … but you’ll feel it. You can reach Ginny Prior at ginnyprior@hotmail.com or on the Web at www.ginnyprior.com. 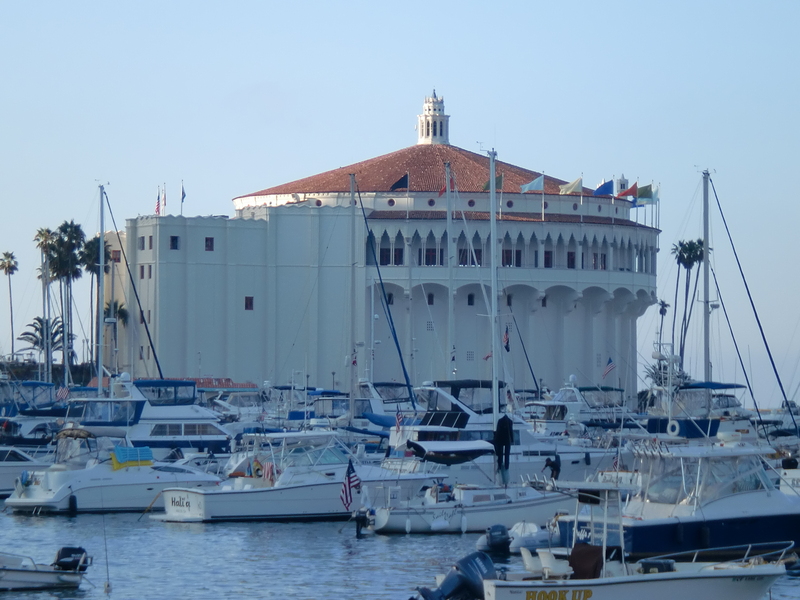 Catalina Express ferries leave from four ports: San Pedro, Dana Point and two Long Beach locations. www.catalinaexpress.com.